Wakefield Paintballing with Delta Force: Adrenalin-pumping fun! If you’re looking for your next adrenalin hit – go to Wakefield paintballing, with Delta Force! Our Leeds Paintball Centre in nearby Cheshire offers customers an exciting outdoor game of paintball that’s guaranteed to leave you feeling exhilarated! 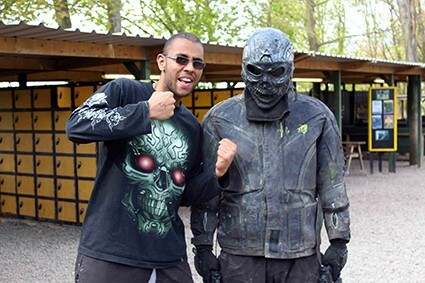 The centre has even recently been awarded the UK Paintball Centre Of Excellence award for the 2013 winter season. 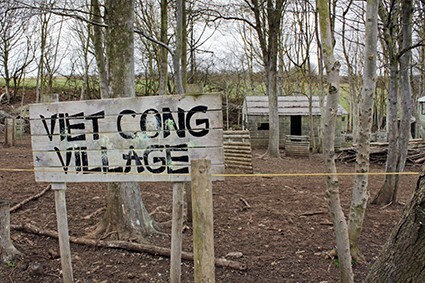 Surrounded by beautiful mixed woodland, the Leeds Paintball centre has 9 movie-set quality game zones for players to explore. The centre’s game zones include: Afghan Fort – set on the deserted hills of Afghanistan; Chemical Alley – a fast and furious game of speedball; A Bridge Too Far – featuring several wooden bridges for players to conquer; London Apocalypse – home to several red double-decker buses; Castle Wallenberg – featuring a large two-storey wooden fortress with sniper tower; The Haunted Graveyard – which hosts a disused church and lots of creepy-looking tombstones and coffins; Mad Murphy’s Jungle Attack – set in the deep dark depths of a tropical rainforest; Tomb Raider – home to a huge Egyptian stone pyramid surrounded by tunnels and Easter Island statues and Viet Cong Village – featuring an abandoned chapel and lots of wooden village huts. Your opponents aren’t the only danger that lurks in the woods though. You could also come face-to-face with the Delta Force Terminator! Armed with his BT4 semi-automatic paintball makers, the Terminator scours the land looking for a gunfight! If he decides he wants to fight you, he’ll raise his guns and point them at you. If you decide to accept, all you need to do is point your paintball gun back at him and open-fire! Should he feel you were a worthy challenger, he’ll give up one of his deadly paintball markers for you to use for the remainder of the game! So, keep an eye out for the Delta Force Terminator as he might have his eyes on you! As well as all this, Wakefield Paintballing with Delta Force brings you top-quality centre facilities. At basecamp we provide proper toilets on mains water, large picnic areas and secure lockers for keeping your valuables safe (for a small charge). We can also provide hot pizza lunches for you and your troops, freshly prepared by an off-site catering company; just order in advance (at the time of booking), or on the morning on your event (before 11am).